Everybody on the Scampy Team is concerned about Tránsito getting stalled out while towing Scampy. Tránsito has lost traction! Several times over the past few days, Tránsito has completely stopped. Right in the middle of a road!! His front drive wheels just spun. No forward motion! Tránsito has never had good traction. But since the rain began, several times the Scampy Team has been put in peril for its very life! Most of these "lost traction" events occurred on hilly roads during rain. Just yesterday, George had to steer sideways across the road to move forward. It was terrifying! George gave Tránsito the smallest amount of gas possible, and Tránsito began to move forward ever so slowly. When we reached the crest of the hill, Tránsito was OK. This evening, Tránsito lost traction right in the middle of an intersection. And that place was flat! This traction loss always has happened during rain. Tránsito - What is to be done? During my lifetime, I have experienced that it was necessary for me to do something several times to finally get that thing done right. To put my current RVing life in perspective and understand how we arrived where we are today, we should go back to June 2016. I was living in La Mesa California in a senior apartment house named Guava Gardens. I believed that my RVing life was over because I was in terrible physical shape! Then a miracle happened! Thru a set of medical events, I learned that my prescription medication was doing me great harm. So, I stopped taking any medication cold turkey! 160 lbs in a matter of months. My blood pressure and cholesterol became normal! My friend Pete Olson invited me to Jojoba Hills RV Park where he is living. I stayed at Jojoba for a week and during that week made the decision to live at Jojoba myself. 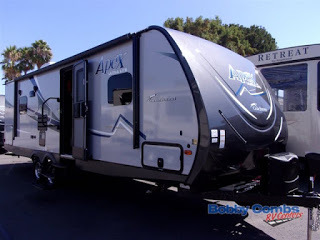 A requirement of Jojoba is that a person has to have an RV in order to submit an application membership. So, I bought Twayler. Twayler - 29' Apex trailer. Lone Wolf RV Park in the City of Apple Valley California. My plan was to live in Twayler until my name on the Jojoba wait-list rose to the top. I wanted to go camping but I could not go camping with Twayler because I do not have a tow vehicle for Twayler. So, I bought a tent! You may recall that my one and only camping trip using this popup tent was a disaster! I learned that camping in a tent at my age is a no-no! 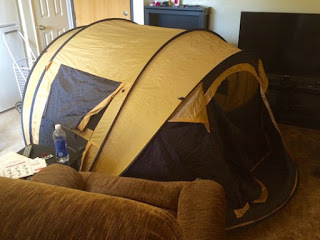 I did not sleep at all that nite and abandoned that tent in the forest [That will show that tent how I feel about him]! I still was needing a way to go camping. That was when I came up with the Scampy solution! 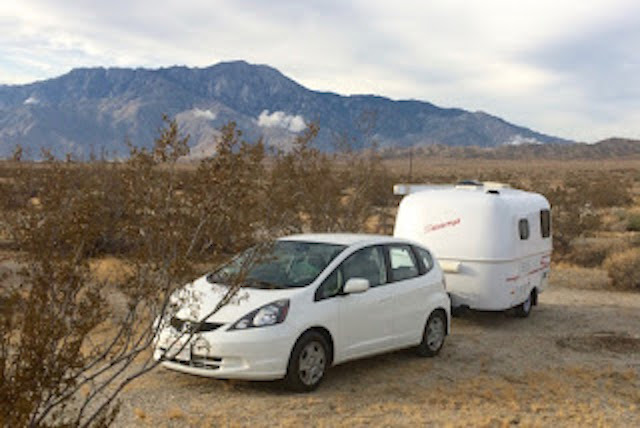 A Scamp Trailer could be towed by my Honda FIT. The Honda FIT turned out to be not a proper tow vehicle for Scampy. The Honda FIT should not be fitted with a trailer hitch because the FIT's unibody construction is inadequate. Wow! Who knew? My Honda FIT tow vehicle! Then I found a Ford Transit in a used car place in Salem Oregon. This looked like a perfect tow vehicle for Scampy! However, I was not aware that the Transit had front wheel drive!! How I could not have found out about that front wheel drive before buying the Ford, I do not know. But, there it is! So, that brings us to now. What to do? It is very clear that Señor Tránsito has got to go. But what tow vehicle would be next? Don: 4WD Rav4 would be excellent. 1. Nissan Frontier - U.S. News Overall Score: 7.3/10. 2. GMC Canyon (tie) - U.S. News Overall Score: 8.6/10. 3. Chevrolet Colorado (tie) - U.S. News Overall Score: 8.6/10. 5. Toyota Tacoma - U.S. News Overall Score: 8.9/10. Michael: How about a Class B MotorHome? The Scampy Team pulled off Interstate #5 to make an Afternoon Camp in the Town of Tillicum. We are in Harry Todd Park which stays open until the Sun sets. On the way here, we went to the Walmart Super Center in the City of Tacoma to purchase a Walmart Protection Plan for Nikon B500. ➜ Fresh Farmed Atlantic Salmon with Monterey Bay Spice, .92 lb. Enough for two suppers! ➜ Grass Fed Beef Ribeye Steak, .55 lb. 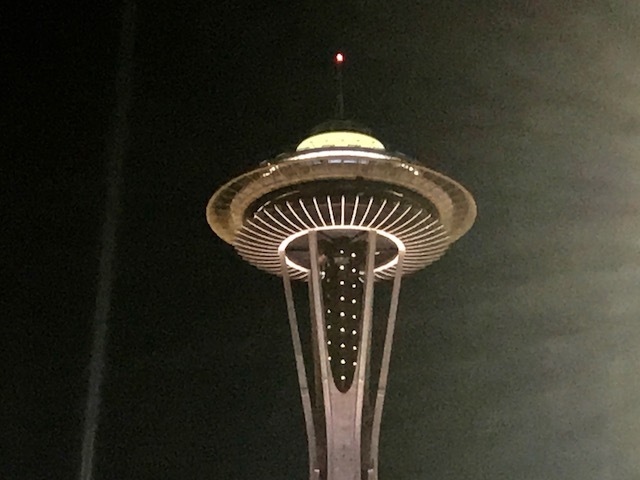 Little iPhone's Space Needle Pic! Nikon B500 has stolen the thunder from Little iPhone! B500 is the first choice for pics now. However, if it's a quickly captured pic that we are after, Little iPhone is the guy! As we were pulling out of Seattle last nite, there it was! The Scampy Team found themselves looking up at Space Needle. 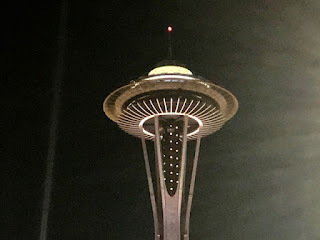 We were sooooo close to the base of the Needle! George quickly stopped Tránsito and grabbed Little iPhone. A few seconds later Little iPhone had captured several pics of the Space Needle! Leaving you stuck is a good reason to either get a real tow vehicle or go someplace where what you have will work. As I recall a few backs you did some tow vehicle planning.. that would be worth a re-read. I am pretty sure what my next tow vehicle will be. But I wanted to get input from Readers before I Blogged about that choice. I am shocked and amazed every time I run across someone who just stopped taking all the proscribed meds & got better. I am one of those people who has (had?) faith in modern American medicine even if it's turned into a medical industry. This is really something to keep in mind as I get older! Thank you. For me I had to become proactive about medical stuff. For example, one time I was scheduled to have surgery. Right at the surgery door, I stopped everything because I was uneasy about the anesthesia. A person has to think for themselves! Hi George... ideas re tow vehicle. I am not an authority on vehicles but it would seem any vehivle would be a 4x4 --- based on your off-road history looking for camping spots and your past adventures. Then it would seem the choice might be either a small truck or a medium SUV because of your need for adequate storage within the towing vehicle. Waiting to see your choice. It looks as if $100 gas is on the way which will translate to $4+ gas. Might consider that when looking for something else. I would look at AWD fourth generation 2013 RAV4 ($14,000) or third generation 2016 Honda Pilot ($27,000) for towing Scampy and giving you the room to store things. AWD is not standard on either but a popular option on both so finding one should be easy. Both are reliable and popular so repairs are readily available if needed. Your trouble with transito spinning the front wheels is classic too heavy a hitch load unloading the front wheels. More weight is needed well forward of the rear axle. Hi George. my thoughts on your next tow vehicle..... go the route RV Sue did and get a nice full size heavy duty van. as in a 1 ton cargo or passenger van. not a sprinter style but the traditional style van. Nissan Frontier - U.S. News Overall Score: 7.3/10. GMC Canyon (tie) - U.S. News Overall Score: 8.6/10. Chevrolet Colorado (tie) - U.S. News Overall Score: 8.6/10. Toyota Tacoma - U.S. News Overall Score: 8.9/10. This is a list of trucks BUT you may want a van or a sedan or SUV ? 4WD Rav4 would be excellent. Perhaps you should have had a weight transferring hitch installed and that would have given the Transit better traction. If I recall all you have is a ball hitch. That means the tongue weight just makes the front end even lighter. But yeah, the correct solution is to get a 4WD vehicle. I just added your "4WD Rav4 would be excellent" to the list! I'd get something that will also tow your stored travel trailer safely unless you are going to get rid of the trailer. The classic mistake of most people choosing a tow vehicle is not getting one that will safely accommodate their current / future towing needs. Whatever you choose, pick something that will be your final one. When I return to California, I will be selling Twayler [My stored trailer]. I am hoping that my next tow vehicle will finally, be the final one! Hi George... more re tow vehicle... I think "road clearance" and "driver's view from driver's seat" (higher better than lower), might be additional criteria. I tow a Silverado 1500HD 4x4 crew cab behind my 40 ft Monaco diesel. Raised cap on truck bed. Why? Easy (high) seat height, able to carry buddies while towing my boat to go fishing, plenty of storage as we now carry 2 Golden EX Buzzaround 4 wheel scooters and a ramp. Multiple needs created an obvious choice for my wife and I. We have over 100,000 miles driving and about 60,000 more towing it. It is a 2005 year. My point,as Mr. Ed made, seems best to list your usage needs and then figure which vehicles meet the most. I guess, from following you many years, a 4x4 small crew cab truck might be near the top of your list. I have begun a list of Reader suggested tow vehicles. And just added your Silverado 1500HD 4x4 crew cab! I say get a '76 Cadillac Fleetwood. The trunk room alone is bigger than Transito! LOL! Nothing like that cool American luxury! Your needs can be met by many different vehicles. My vote would set you back about $40,000. The new Subaru Ascent can tow up to 5000 pounds and you'd have plenty of room inside the back for your needs. I really need a truck for my tow vehicle which has the room to store all my tools and supplies that I use for my on-the-road projects. Nice looking car, that Subaru Ascent! George, I am a big Toyota Tacoma Fan. Very capable truck. With a cap I find the bed very usable. I have an aluminum pole with a hook to reach stuff deep in the bed. I've added your Toyota Tacoma suggestion to the list. A Toyota Tacoma would do the job! Ford F-150 with a small eco-boost engine for good gas mileage; 1) no four-wheel drive or all wheel drive (it takes away from your gas mileage)--rear wheel posi-traction is all you need; 2) no low profile tires because it also takes away from your gas mileage, just get one with regular tires; 3) get one with a super cab (for easy reach of items you need while on the road) 4) get the truck with the short bed (will be easy to find a raised top to go over the short bed and will shorten the length of your rig); 5) the rear axle (most likely a 3.2 rear axle) on the F-150 Ecoboost will probably be beefy enough to handle weight inside the truck and weight of Scampy without a weight distribution system on the hitch which the itty-bitty trucks will require; 6) the F-150 Ecoboost should come with large telescoping side mirrors right from the factory; 7) the F-150 Ecoboost has built into its computer (once the connection is made to Scampy) automatic sway control to assist in preventing jack-knifing of Scampy--she will track right behind the F-150, she will easily recover on wet roads; 8) because of safety of a "standard" truck, your insurance will be cheaper than a smaller truck of the same year and approximate value; and 9) and of course, there is built in tow/haul with the push of a button when you ride those mountain roads. At this time, I can't think of anymore reasons, but I think I probably will later. Look up the reviews in Consumer Reports; that will help you a lot. A Ford F-150 might do the job. I've add your suggestion to the list. If your loaded Scamp weighs 3000# or less then the 2005 Suzuki XL-7 I have for sale would be perfect. It has hitch & brake controller installed & only a few miles down I-5 from you. "I need the space of a truck for the tools and supplies that I use for my projects." Your Suzuki would not do. You might be surprised with what you can haul with both the 2nd & 3rd row seats folded down. And there is a large cargo pod on the roof rack for a considerable amount of lighter stuff. We have two tow vehicles for our 2500# trailer (Coleman coleman). A Honda Pilot and a Ford Escape with a six cylinder engine (tow rate 3000#). We bought the Honda Pilot because the Ford Escape would overheat on the mountain passes. I like the Ford Escape better and just slow down on the mountain passes because it got better gas mileage. Towing vehicles the escape gets 12-14 and the Pilot 8-12. If you would like a very nice Pilot we might sell it to you. Thank you for your offer to sell me your Honda Pilot. However, I need the space of a truck for the tools and supplies that I use for my projects. George, how about a Class B MotorHome? You would have less space for all the things you carry now in Transito but if you sold all 3 and went with a class B you would have more time to travel and move around with ease. It might not work because I know you enjoy the projects. I just added your "how about a Class B MotorHome?" to the list. I really like sooooo much the feel of my Scamp trailer. And have made a lot of changes/improvements. I would not like to give all that up. However, your Class B MotorHome suggestion is attractive! George, installing a weight distributing hitch would also take some of the rear weight and place it on the front, where you need it! makes hitching/unhitching a little more difficult but might improve towing. good luck, happy camping. I do not feel that doing anything would improve Transito's towing. I really do need a different tow vehicle.